The coin corresponds to the description at number 14 in the Moushmov catalog (in the catalog the legend is Q HER ETR, with HER instead of H). The issue of local coins began in Dacia in 246/247. At that time emperor Philippus the Arab granted the right to strike coins in Dacia. The last provincial coins were struck in 255/257, with AN XI in exergue. The coins PROVINCIA DACIA were also found in Pannonia and Moesia Superior, Roman provinces neighbouring Dacia. Most probably these coins were struck at Sarmisegetusa, but there are opinions that the coins were struck at Apulum or even at Viminacium. (The provincial coins struck at Viminacium in Moesia Superior have very similar design with the Dacian ones.) 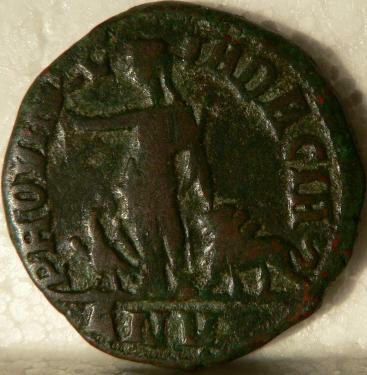 Many Provincia Dacia coins are heavily worn, a sign that they circulated for a long time. It is commonly accepted that in Dacia were struck sesterces, dupondii and asses. Asses and dupondii were struck only in the first three years of the mint existence and they are scarce. The inscription AN V in exergue shows that the coin was struck in 250-251. The system of numbering the years from an important event was very spread in the Roman provinces. A local era was used also in Dacia. The Dacian local era seems to have begun in July-September 246 (these months are certain, because emperor Aemilianus, who ruled the Roman Empire for three months in 253, appeared on Provincia Dacia coins, with years 7 and 8 (AN VII and AN VIII). Most probably the beginning of the new era is connected with the invasion of Dacia by the Carpian tribes. The attack of the Free Dacians began in 245 and was repelled in the next year, after the coming of emperor Philippus Arabs to the Danube. Philippus granted some privileges to the province of Dacia, and the grateful citizens counted the years from the beginning of the new era of liberty. The Roman Dacia was defended by a lot of soldiers, both legions and auxiliary troops (alae - cavalry units, cohorts - infantry units, numeri - ethnic militia). The Roman armies in Dacia counted about 50.000 troops. Legio XIII Gemina remained in Dacia for the entire period of the Roman rule, having its castrum at Apulum, nowadays Alba Iulia. Before the conquest of Dacia this legion had the camp in Pannonia Superior. After the Roman retreat from Dacia the Thirteen moved to Ratiaria, in Dacia Ripensis. The surname of a legion was used in the imperial period to differentiate the units, because there were more than one with the same number. The name Gemina means twin, because there were more than one legion bearing the same name, but having different numbers. Legio V Macedonica came in Dacia Porolissensis, at Potaissa (nowadays Turda, in the county of Cluj), in year 168. After the Roman retreat from Dacia the Fifth moved to Oescus. The name of the legion refers to the region where the unit was set up - the Fifth was enlisted close in time to the battle of Philippi, in Macedonia. The presence of the eagle and the lion on local coins, symbols of the Dacian legions, is a homage to the Roman armies garrisoned in the province. The propagandistic message is clear enough: the peace in the province was obtained after the victories of the Roman armies stationed in Dacia. 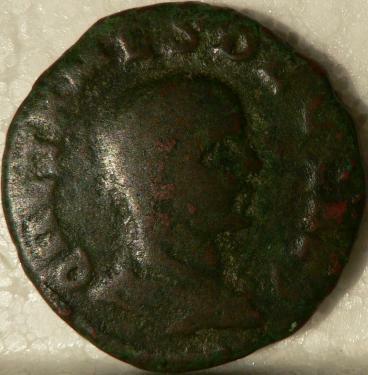 Quintus Herennius Etruscus Messius Decius was the elder son of emperor Traianus Decius and empress Etruscilla. He became Caesar in 250 and Augustus in 251. Herennius Etruscus fell in battle with the Goths of king Kniva in year 251, somewhere between Nicopolis ad Istrum and Oescus. Jordanes - who lived in the 6th century - noted in his book "The Origin and Deeds of the Goths" that Traianus Decius said after he was announced of his son's death (in order to raise the moral of his troops): "Let no one mourn; the death of one soldier is not a great loss to the republic".